PILDAT has been assessing the quality of democracy in Pakistan since 2002. 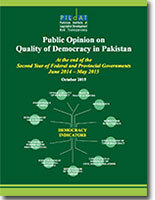 In 2013, for the first time, PILDAT commissioned a nationwide poll to gauge public opinion on quality of democracy. A country-wide nationallyrepresentative survey on assessing public opinion on quality of democracy was undertaken in September 2013 upon the completion of 100 days of National and Provincial Assemblies and Governments, elected through the May 2013 General Election.